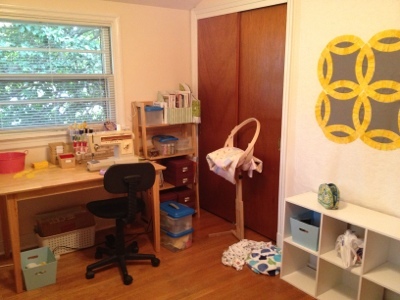 Tales of Ineptitude: The "Studio"
So I'm not really so pretentious as to seriously call my sewing room a studio, when I am in no way a real artist, but I find that it makes me feel marginally more creative, so lets go with it. 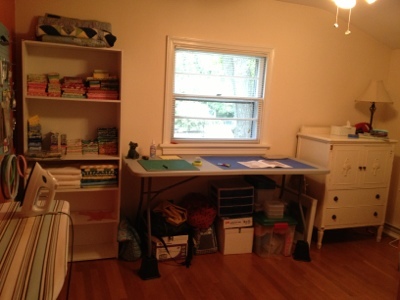 The sewing room is actually the most "moved into" room of my house, so I thought it might be nice to show the progress a little bit. It's the only place in the house where there is something hanging on the walls. But please pardon the crappy phone photos. 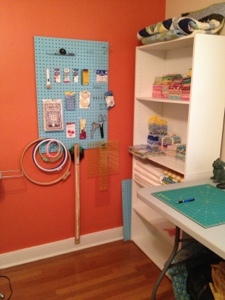 This is one of my favorite parts - the pegboard! 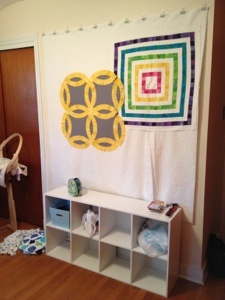 It's like my very own sewing store, right at home! I'm one of those people who will forget which size needles I already have, or where I put those scissors, so having everything out where I can see it, but it's still neat, is really great. I just got a pegboard from Home Depot and spray painted it. Easy peasy. Also, I inherited that wall color. It won't stay that way forever... just sayin'. The cutting table is an inexpensive folding banquet table that I put up on bed risers to make it counter height. The only thing I would want is for it to be a little deeper. Maybe I'll get another one and put them together?